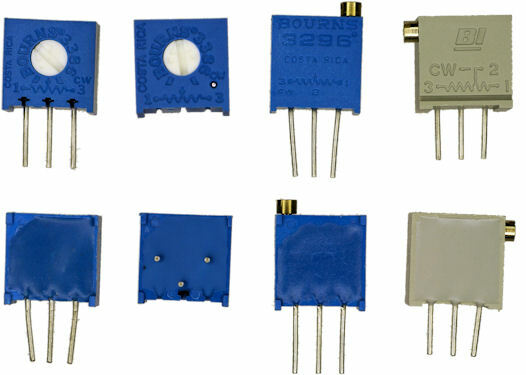 Trimpots (also called trimming potentiometers) are small variable resistors installed on printed circuit boards for fine-tuning and other adjustments. The next page shows the inner workings of trimpots, but we'll begin by taking a look at trimpots that you can buy for your projects. There is a huge variety of trimpots available. We'll focus on those that have one-tenth inch (2.54 mm) spaced, PC solder pin, through-hole leads. These trimmers are compatible with solderless breadboards	and perfboards favored by hobbyists. Note: Part numbers on this page are for 20 kilohm resistance. Many other resistances are available. Parts are manufactured by Bourns unless otherwise noted. Here are the most common trimpots: 3/8-inch square and usually blue. Three-eighths inch square trimpots. Single-turn and multiturn. 3386C or 3386W single turn, side adjust. Digi-Key 3386W-203LF. Mouser 652-3386W-1-203LF. You can bend the leads and lay the trimpot flat to use this as a top adjust. 3386P single turn, top adjust. Digi-Key 3386P-203LF. Mouser 652-3386P-1-203LF. 68X multiturn (20 turns), different side adjust. Gray color. Manufactured by BI Technologies. Digi-Key 987-1114. Mouser 858-68XR20KLF. Multiturn potentiometers allow finer adjustments; the resistance changes slowly with each rotation of the screw. In comparison, on a single-turn trimpot the resistance sweeps the entire range from near 0 Ω to full resistance in about 240°. 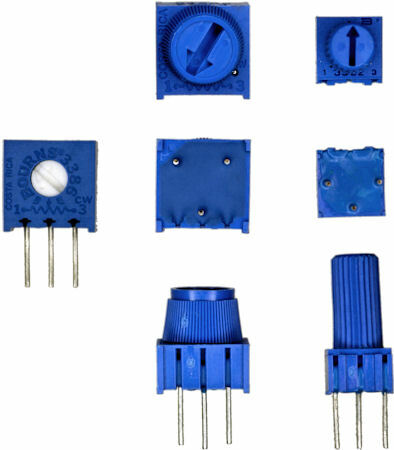 Although multiturn potentiometers permit more precise resistances, they are more expensive and obviously take more user effort to make large adjustments. Look at the leads of the 3386P trimpot (pictured above -- second from the left, bottom row). The pins are arranged in a tripod fashion that reduces twisting of the part on the PCB when the dial is rotated. If you have enough space on your circuit, the tripod pattern is preferable. Try a 3386X or 3386H for side adjustments with a tripod terminal style, instead of a 3386C or 3386W. Trimpots are adjusted using tiny screwdrivers. A knob is more convenient if an adjustment is going to be made often or if tools are not accessible. In fact, if adjustments are going to be made very often, then full-size potentiometers are more appropriate, as trimpots are only designed for a lifespan of 200 rotational cycles. Bourns trimpots with knob 3386T 3362T. 3386F-T single turn, top adjust, 0.22″-length knob. Digi-Key 3386F-203TLF. Mouser 652-3386F-1-203TLF. 3362P-T single turn, top adjust, 0.391″-length knob. Digi-Key 3362P-203TLF. Mouser 652-3362P-1-203TLF. Notice the 3362P has a longer knob and yet a smaller base. The trimpots that we’ve examined so far are the classic 3/8″ base. As with all other electronic components, even trimmers are shrinking. There is a wide variety of space-saving 1/4″ trimpots that retain the 0.1″ lead pattern such that they fit in breadboards. A selection of compact quarter-inch trimpots. 3339P multiturn (4 turns), top adjust, round. Most expensive. Digi-Key 3339P-203LF. Mouser 652-3339P-1-203LF. 3329S single turn, side adjust, rounded. Expensive. Digi-Key 3329S-203LF. Mouser 652-3329S-1-203LF. CT-6 single turn, top adjust. Made by Copal. Nice yellow center. Digi-Key CT6ER203. 3362X single turn, side adjust. Digi-Key 3362X-203LF. Mouser 652-3362X-1-203LF. The last two trimmers are less expensive than their 3/8-inch counterparts. Given the reduced size, while maintaining compatibility, it seems like a good choice to switch over to 1/4-inch parts. Trimpots are used more often than full-size potentiometers in hobbyist projects, because trimpots are small, less expensive, and breadboard compatible. Unfortunately, because trimpots are usually hidden inside of commercial products, few manufacturers offer decorative or color models. All too often, our robots and DIY boards suffer bland blue, white, and gray. 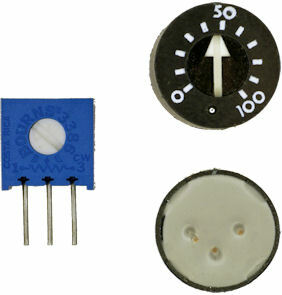 Trimpot half-inch round TT Electronics 93PR20KLF. If you have a half-inch to spare, the TT Electronics/BI Technologies single-turn round trimmer is an attractive option. Available from Mouser (858-93PR20KLF) or Digi-Key (987-1173 for 10 kΩ). I hope these choices encourage you to select a novel trimmer for your next electronic project. As my existing stock is depleted, I anticipate switching to smaller and more diverse trimpots with tripod wire patterns. 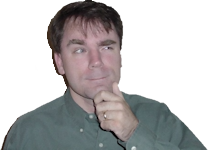 Variable resistors are significantly more expensive than fixed resistors. Are trimpots really that much more complicated to produce? How do trimpots work? What would you see if you cut one open? Let’s find out!